NOTICE > Notice > 2018 Ryu Siwon Birthday Party「Touch」DVD! 2018 Ryu Siwon Birthday Party「Touch」DVD! 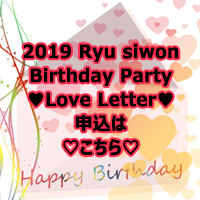 12月発売予定の2018 Ryu Siwon Birthday Party「Touch」DVD!